The File tab allows you to specify a file into which the log should be placed. At the top is an indicator of whether file logging is in progress and a button for enabling or disabling it. (Note that you cannot enable it until a file is selected below.) The button allows you to pause and restart file entry. When you switch in the project window to viewing another simulation, the file logging is automatically halted; if you return to the original one and want logging to continue, you will need to re-enable the file logging manually using the button at top. In the middle is an indicator of what file is being logged to. To change it, use the Select... button. On selecting a file, file logging will automatically start. If you select a pre-existing file, Logisim will ask whether you want to overwrite the file or append the new entries onto the end. At bottom you can control whether a header line should be placed into the file indicating which items are in the selection. If header lines are added, then a new header line will be placed into the file whenever the selection changes. Entries are placed into the file in tab-delimited format corresponding closely to what appears under the Table tab. (One difference is that any header lines will give the full path to components lying in subcircuits.) The format is intentionally simple so that you can feed it into another program for processing, such as a Python/Perl script or a spreadsheet program. So that a script can process the file at the same time as Logisim is running, Logisim will flush the new records onto the disk every 500 ms. 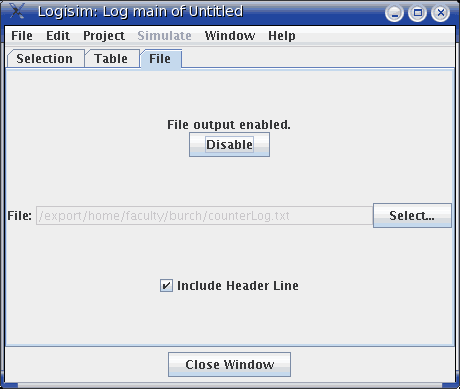 Note that Logisim may also intermittently close and later re-open the file during the simulation, particularly if several seconds have elapsed without any new records being added.